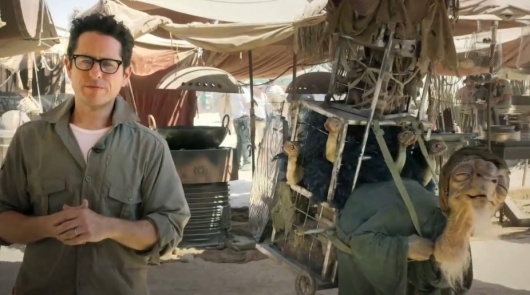 The first video from the set of Star Wars: Episode VII has been released, but not for the purposes of showing off the movie. The video is to announce an exciting new contest in which one lucky fan will win a trip to London where they’ll be a VIP guest of director J.J. Abrams, meet the cast, see the movie being filmed, and even get the full makeup and costume treatment before filming an actual scene for the movie. That’s right, you could be in a Star Wars movie. Better yet, the contest is to benefit a good cause. But since all but one person and their friend of choice will get to experience this, the rest of us have to look for something else to be excited about in the video. Enter random alien cameo appearance! Some kind of elderly creature—likely to be one of the many going about their business during a scene in the movie—shows up while Abrams is talking. And while cool, the most exciting part is that it’s a real practical effects creation, hopefully a subtle hint at restrained use of digital effects in Episode VII. Continue below to check out the video and find out where to enter the contest. The contest is part of Star Wars: Force for Change—an initiative to help kids and families around the world—which will benefit UNICEF Innovation Labs and Programs. No purchase is necessary, but a donation is if you want to enter the contest. It’s set up similarly to a crowdfunding campaign you’d find on Kickstarter. The lowest level is a $10 donation, and gets you an entry into the contest and makes you a founding member of Star Wars: Force for Change, complete with a digital badge. The second tier is $40, and gets you four entries in the contest and a digital thank you card from Abrams and the Episode VII cast and crew. This continues for many tears, many of which offering some cool physical rewards, all the way up to the final $50,000 tier, which gets you 5,000 entries in the contest and an advanced private screening of Episode VII for you and 20 guest in or near your hometown. If you’d like to enter the contest and try your luck at winning the chance to be in Star Wars: Episode VII, be sure to click right here.